The former chairman of the US Federal Reserve Alan Greenspan has said President George W Bush pays too little attention to financial discipline. In a book to be published next week, Mr Greenspan says Mr Bush ignored his advice to veto "out-of-control" bills that sent the US deeper into deficit. And Mr Bush's Republicans deserved to lose control of Congress in last year's elections, he charges. Mr Greenspan, 81, stepped down last year after nearly 19 years in the post. 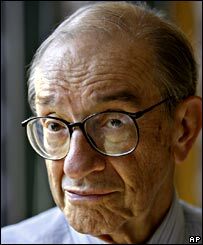 In The Age of Turbulence: Adventures in a New World, Mr Greenspan - who has described himself as a "lifelong libertarian Republican" - spares no criticism of the Republican party. He writes that he advised the White House to veto some bills to curb "out-of-control" spending at the time Republicans controlled Congress. President Bush's failure to do so "was a major mistake", he said. "Little value was placed on rigorous economic policy debate or the weighing of long-term consequences," he says of the Bush administration. And he charges that Republicans in Congress "swapped principle for power" and "ended up with neither". Mr Greenspan retired in early 2006 after serving under six US presidents - either as Federal Reserve chairman or chairman of the Council of Economic Advisors. He now runs a private consulting company - and is an honorary adviser to the UK government.